THE JURY IS out on whether Congress president Rahul Gandhi’s hug to Prime Minister Narendra Modi during the no-confidence motion debate in the Lok Sabha was spontaneous or pre-planned. Sources close to Rahul insist that it was unscripted, but the idea of hugging Modi as an act of ‘Gandhigiri’ had been on his mind for the last few months. They claim that United Progressive Alliance chairperson Sonia Gandhi, too, was taken by surprise, and she asked him what he was up to. Planned or unscripted, it was politics of optics, meant to be captured by the cameras. It was supposed to have an impact, and convey a message. The impact was that it got everyone, including Modi, talking about it. And, the message was that the hug represented a politics that was different from the BJP’s ‘politics of hatred’. Rahul stole Modi’s limelight. So far, Modi has been choosing whom to hug, and for the first time, it was the other way round. Sounding the bugle for the Lok Sabha elections, Rahul laid down the blueprint of his party’s campaign—Brand Modi will be the target. The idea conveyed by Rahul in his speech was that while Modi had promised a decisive and strong leadership, his reign is marked by an atmosphere of fear and insecurity. He attacked the prime minister for his silence on incidents of lynching and atrocities on dalits, backward classes, minorities and women. He also accused Modi of being anti-poor and caring only for the interests of his industrialist friends. He said Modi had breached set norms in the purchase of Rafale aircraft from France, and the deal smacked of a scam. “Modiji, aap chowkidar nahi, bhagidar hain [Modiji, you are not a watchman, but a partner],” said Rahul, referring to Modi’s earlier pledge to be a chowkidar of the country who would not allow any corruption to take place. Modi knows the importance of packing words with emotion. He did make a comeback in his reply on the no-confidence motion, launching a blistering attack on Rahul. He said Rahul was a naamdar (entitled person), while he was a kaamdar (worker). Modi also sought to blunt Rahul’s ‘jumla strike’ jibe by accusing him of insulting the soldiers who had carried out the surgical strike on Pakistan. The BJP, since then, has been in an overdrive to rubbish Rahul. “Hallucinations can give momentary pleasure to a person. Therefore, to hallucinate after an embarrassing performance that he has won future election or to hallucinate that he is the reincarnation of Mark Antony... is a serious problem,” wrote Union Minister Arun Jaitley. The change in the Congress’s strategy with regard to Modi was clear in the inaugural meeting of the new Congress Working Committee, held a couple of days after the no-confidence motion. The CWC agreed that the political narrative to be pursued was that the prime minister represents failed promises and that the ruling dispensation stands for an ideology of hatred and divisiveness. The BJP, on the other hand, is highlighting Rahul’s ‘inconsistency’ as a leader, and also hopes to drive a wedge among the opposition parties over its prime ministerial candidate. Also, a big challenge now is to maintain a clean perception about the Rafale deal. The BJP says that in the past four years, not a single allegation of corruption has been levelled against the government. It insists that the Congress, too, has not been able to pinpoint any financial irregularity in the deal. Another issue of concern is the lynchings in BJP-ruled states. A group of ministers, led by Union Home Minister Rajnath Singh, is devising means to counter lynchings perpetrated by gau rakshaks. 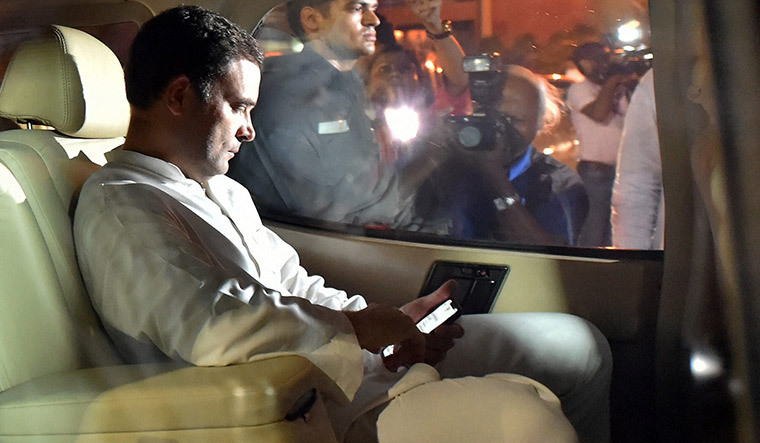 With the debate in Parliament heralding the start of election season, the CWC decided that Rahul would be the face of the party for the 2019 Lok Sabha elections, and also authorised him to stitch state-specific alliances to take on the BJP. Many leaders emphasised that the Congress, since it was the only opposition party with a pan-India presence, has to be the pivot of an anti-Modi, anti-BJP alliance. Most opposition parties feel that this is the Congress’s effort at pre-poll positioning. At present, many regional parties do not see a lead role for the Congress in an opposition alliance. A rude reminder of this came promptly from Mayawati, who announced that the Bahujan Samaj Party was ready to contest all seats in Madhya Pradesh, Rajasthan and Chhattisgarh. “We will not be in an alliance if we are not offered a respectable number of seats,” she said, also warning that the same could apply to Uttar Pradesh. This came at a time when top Congress sources claimed that the basic architecture of the opposition alliance was in place in Uttar Pradesh and Bihar. Also, Mamata has launched her own efforts to form a federal front against Modi, and has planned a grand show of opposition unity in Kolkata in January next year. “Mamata Banerjee is one of the seniormost leaders in this matrix.... It is natural that people are looking at her when it comes to New Delhi in 2019,” said Trinamool Congress leader Derek O’Brien. Rashtriya Janata Dal’s Tejashwi Yadav, a staunch supporter of Rahul, said it was too early to talk about the face of the opposition alliance. “There are many important leaders among the opposition parties. Also, if we remain entangled in our egos, as to who will give seats to whom, or who will be the face of the alliance, we will not be able to save the nation,” he said. Sources close to Rahul say that the Congress is ready to back any other opposition leader for the top post if the situation so demands. Rahul’s task is cut out in terms of forming alliances, as depicted by Mayawati’s hard bargain. While Mayawati has demanded a share in Rajasthan, the Congress feels it can do well on its own there. Alliances are in place in Maharashtra, Karnataka, Bihar and Kerala. In West Bengal, the state unit of the Congress is divided over whether the party should ally with the Trinamool or the left, with the balance tilted towards the latter. The Congress, however, would find it difficult to form an anti-BJP alliance in Odisha. Biju Janata Dal leader Pinaki Misra ruled out the possibility of the party getting into an alliance for the coming elections. “The BJD is at 50 per cent vote share. The Congress and the BJP together are at 45 per cent. And they will not come together. So, we do not need to get into an alliance,” he said. In Andhra Pradesh, the Congress has announced that it will go it alone. Both the ruling Telugu Desam Party and Jaganmohan Reddy’s YSR Congress have so far shown no interest in allying with it. In Delhi, the Congress finds itself sidelined politically, but tying up with the Aam Aadmi Party would mean ceding further space to Arvind Kejriwal’s party. Meanwhile, experts say the assembly elections in Rajasthan, Madhya Pradesh and Chhattisgarh, which will primarily be a Congress vs BJP contest, will decide how much heft the Congress will have as convener of opposition unity. “The Congress can project Rahul as its PM face. However, it all depends on the results of the assembly elections. If the Congress fails to win any major state, it will have to eat humble pie,” said Abhay Kumar Dubey of the Centre for Study of Developing Societies. As for the BJP, ally trouble is a near and present danger. The no-confidence motion was initiated by ex-ally TDP. And, the Shiv Sena abstained from voting. The Sena has been maintaining an ambiguous stance with regard to the NDA government, and BJP president Amit Shah has asked party members in Maharashtra to be ready to contest alone. While it is still being debated as to who won the battle of perception in the no-confidence motion, the fight before the Lok Sabha polls is bound to get more interesting.